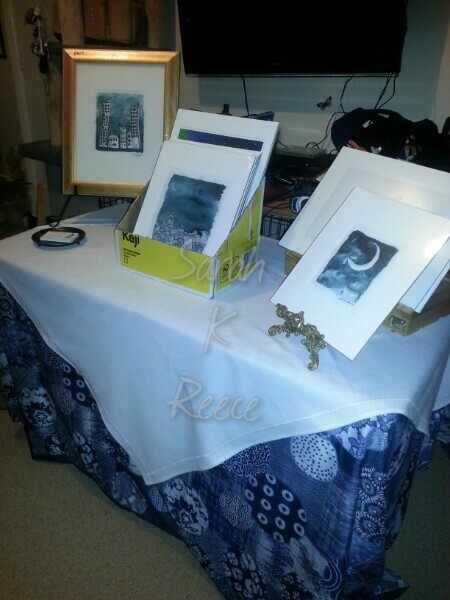 This was my rehearsal set up today – Rose and I are preparing for a stall at the Pregnancy Loss Australia walkathon tomorrow, where for the very first time I will be offering fine art prints of my work for sale. I am anxious and would far rather hide home in bed. We’re both feeling a little raw, pleased to be involved, inspired, but also vulnerable. Holding each other in tears in the kitchen. Together we are stronger. We’re both working hard to use humour and everything else we know to help stop the bad hours spiralling into awful days. I actually slept peacefully last night, for the first time in a long time. I dreamed deep dreams the meaning of which was a gift: that what I have to give to the world has never been much in the way of financial support. It’s always been about kindness and helping people feel more alive. And that’s mostly what my household needs at the moment anyway, so let go of the other ideas and focus on that. I can see the sky again, can breathe again, for moments. The anxiety is still a herd of wild horses running, but I can steer a little, suggest a little, and today that was enough. Today was a pretty good day. Tomorrow, because Rose believes in me, I’m going to sit in a tent on some grass with my art, and hope that other people will be kind to me too. Wish me luck. may they be kind,- yes by all means – but purchasers of your art (and others) will recognise the value of what you are doing. May you do so yourself, in a yogic kind of fashion – through and through. Blessings for tomorrow and always!